The British country of Gibraltar began producing Angel gold coins in 1998 and produced their last Angel gold coins in 2003. Each of these six years brought a different design of the angels (or cherubs). Made of pure gold (99.9% the 1/25th ounce is about 13.92 mm in diameter, the 1/10th oz is about 18 mm, and the 1/5th oz. is 21-22 mm (about the size of a US nickel). The Gibraltar gold Angels come sealed in a soft clear plastic protective material. Some collectors call these cherubs or royals gold and silver coins. 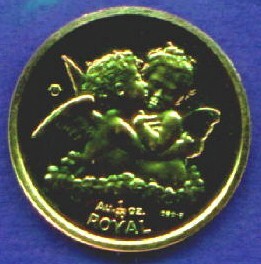 The Isle of Man also produced some Angel design gold coins for a few years. The old France 20 FRANC gold coin below is approximately 21 mm in diameter. They were produced for a number of years in the late 1800's. Made in the late 1800's. 21 mm diameter. Made in the late 1800's (over 100 years old). These genuine gold coins (like American gold coins of the times) were made of 90% gold. They contain 18.67% of an ounce of gold. Many of the angel gold coins were melted during World War 1 and World War 2. Very Fine or better condition - date of our choice. France ROOSTER gold coins too. Click Here. - has the Queen's portrait on the other side. Depicts two cherub angels playing - celebrating. Contains a twenty-fifth ounce of pure gold. This mint condition Proof coin has the same design as the gold, with the 2003 Angel - Cherub design on one side and Queen Elizabeth on the other. These 1 Royal coins contain 1 troy ounce of 99.9% pure solid SILVER. Measures about 38 mm in diameter ( 1 1/2 inches across ). From Gibraltar. Comes in a clear plastic holder. Brilliant Uncirculated proof like condition. - from the country of Gibraltar Cherub - Angels design. 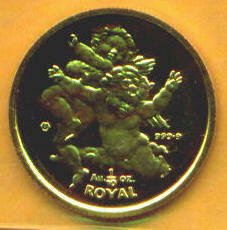 Gibraltar changes the design of the Angels on their coins each year. Contains a tenth of an ounce of pure gold. Depicts a winged cherub angel. Depicts a winged cherub angel head. This design is different than the smaller size 1999 Gibraltar angel coins. Instead of one, it depicts 4 different Cherubim faces. A full Fifth of an ounce of Gold. Queens portrait is on the reverse. Sometimes nicknamed the "Kissing Angels" coin.